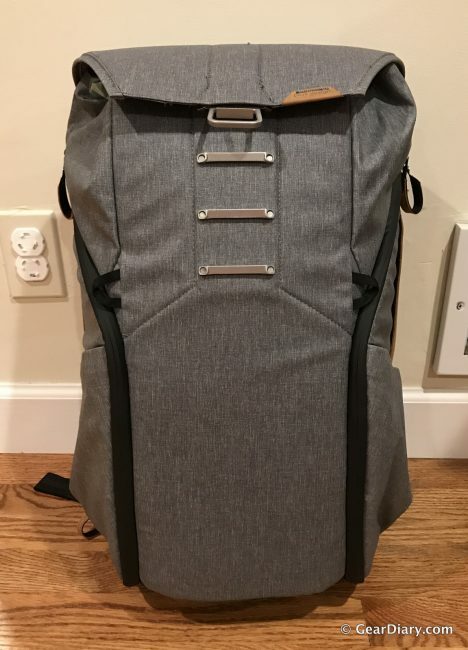 Peak Design put a ton of time into creating the Everyday Backpack and it shows. 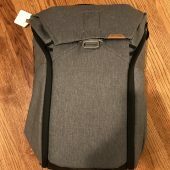 Made of extremely high-quality materials, with best-in-class design details around every corner, this is a backpack worthy of the highest praise. This backpack is secure, versatile, easily accessible, weatherproof, expandable, re-configurable, yet maintains a clean, minimalist aesthetic. Top slip pocket with magnetic closure to hide and provide quick access to high-value items like wallets, phones, etc. Premium materials and build: Hypalon-reinforced and bar-tacked at stress points. Soft, durable mixed cotton twill interior for protection, durability, and luxurious feel. Ash color backpacks replace Hypalon touchpoints with NuBuck leather. The Everyday’s most unique feature is the fact that you can access the main compartment three different ways. You can open the patented MagLatch on top, which allows the top of the shell to swing open, revealing a wide-mouthed opening at the top that allows you to easily find what you’re looking for. 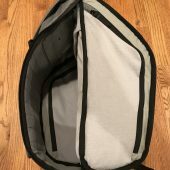 The other two ways to get into the main compartment are through the two side zippers. 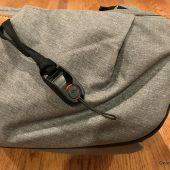 What’s nice about these zippers is that you can keep the bag on your shoulder, swing the bag to your front, unzip the bag, and access whatever you need. This is a really convenient feature when I’m hustling to catch the bus and can grab my bus tickets and AirPods without stopping. 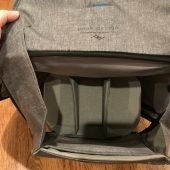 Inside the two side panels are zippers that separate smaller organized pockets from the rest of the bag, allowing you to keep smaller items safe and sound, like the aforementioned bus tickets and Airpods. The MagLatch itself is a one-of-a-kind latch system that provides cheetah-quick access to the top of the bag. 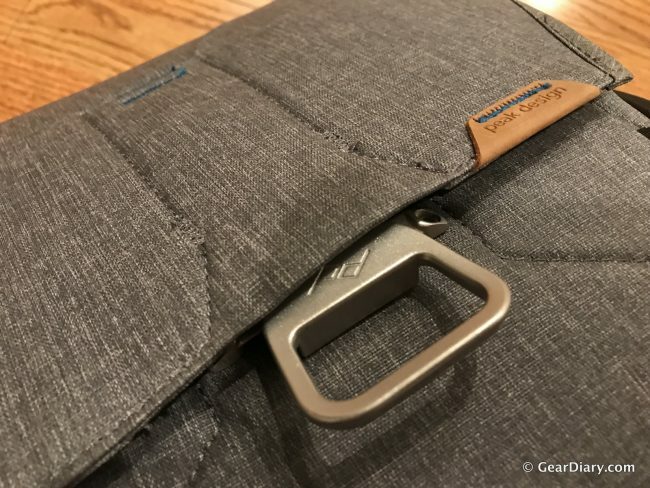 Peak Design designed this latch specifically for this bag, allowing for one-handed, no-look, quiet, and secure entry to the main compartment. There are four ladder lock locations on the front of the bag, which provide different latch points for expandability of the main compartment up to 8L. The MagLatch’s magnet catches the plate creating a lock-free soft closure. Once you pull up on the latch, it will securely lock onto the nearest ladder. All you have to do to open it is to pull up on the latch handle. The MagLatch is incredibly easy and fun to use, although it may not sound like it. 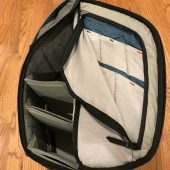 Another one-of-a-kind feature in a bag full of one-of-a-kind features are the three Flex-Fold dividers that are included with each bag. 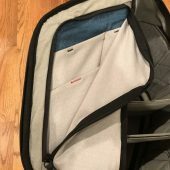 These custom-designed dividers use hook-and-loop (the non-branded name of the Velcro attachment system) to attach to the front and back of the interior of the bag. 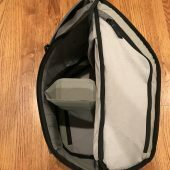 You can move them wherever you want in the bag to endlessly customize the different compartments of your bag. What’s more is that the sides of the flex-fold dividers can fold up, hence the name, and can create little separate shelves for even further customized organization. 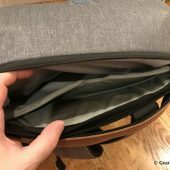 The main exterior shell is made of a super durable 400 Denier nylon canvas with high-density padding that is DWR impregnated and poly coated twice on both sides, which makes it weatherproof. 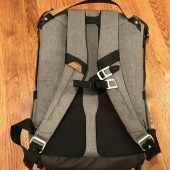 Doubling-down on the weatherproofing, the backpack also features weatherproof exterior zippers that have flaps to cover the zippers and protect your gear from the elements. 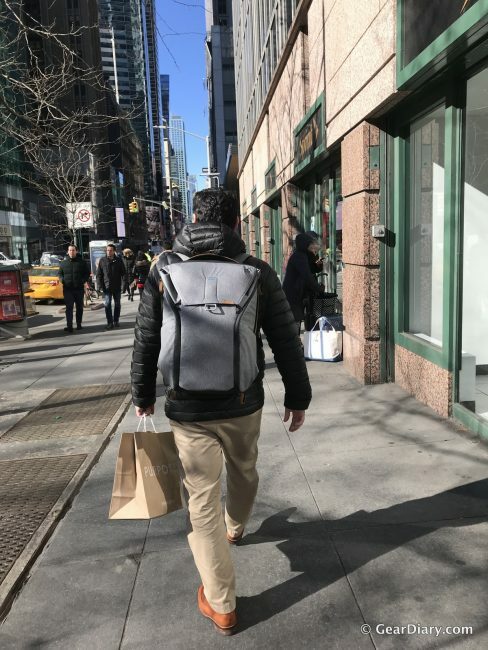 I’ve been commuting into New York City from New Jersey on a daily basis with the Everyday Backpack for the last couple of months, and I can tell you from experience how weatherproof the bag is. 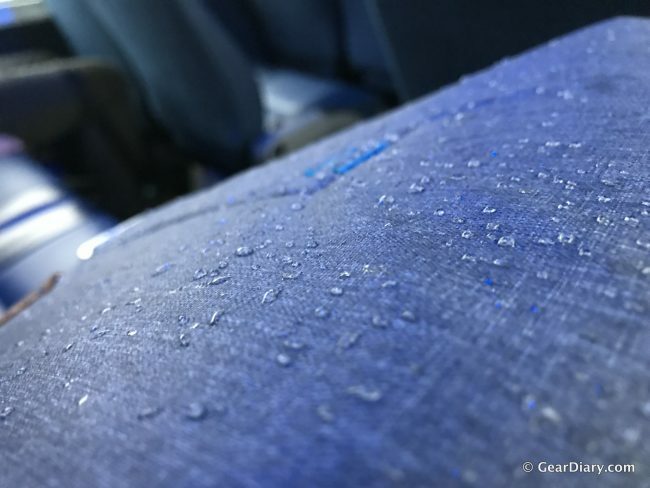 The water beads up on the surface of the bag and never ever penetrates the exterior shell. My only complaint is that the bag is slightly heavier than I’d like in a daily commuter backpack. The 30L bag itself weighs about 3.4 lbs, which is almost a full pound heavier than my previous commuting backpack. 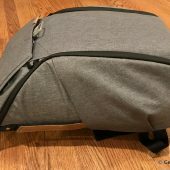 However, the bag is so well made to fit your body that the weight doesn’t feel too bad because it’s evenly distributed on your back. 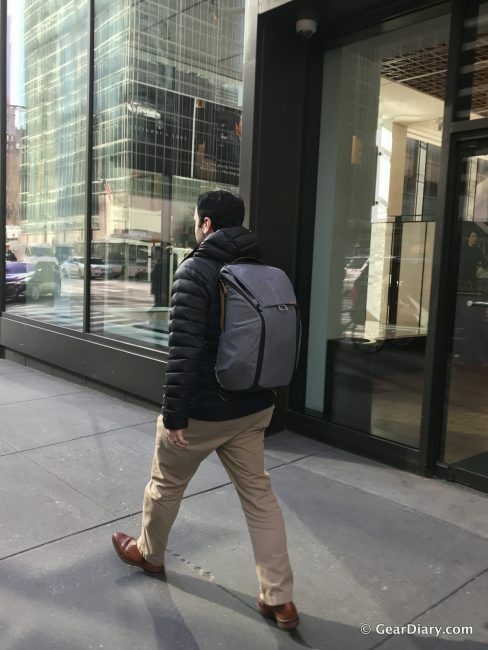 The Peak Design Everyday Backpack feels like something that will last longer than my car with premium materials that are reinforced at touch points, all-custom hardware, and comfortable shoulder straps. 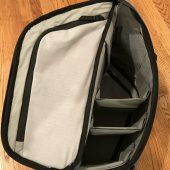 What’s great is that, if something were to go wrong with your bag, it’s covered by a lifetime warranty. 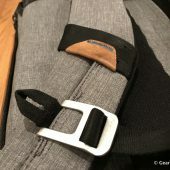 Peak Design will fix or replace your bag should it befall any mishaps. 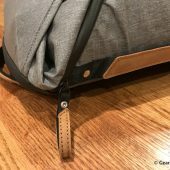 A friend of mine owns this bag and somehow the anodized MagLatch hardware cracked off. 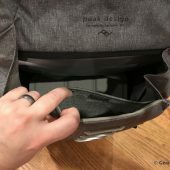 Peak Design swiftly replaced the bag, no questions asked. This is a seriously high-quality bag, no buts about it. Peak Design thought of everything when designing this bag. 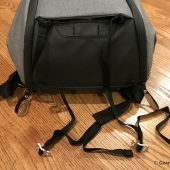 From adding carry handles on three sides of the bag to the way you can access the side pockets without taking the bag off of your back, zero corners were cut when making the Everyday Backpack. 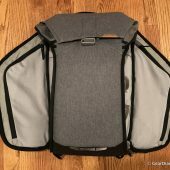 If you’re looking for a camera bag, commuting back, or even a diaper bag, the Everyday backpack will take accomplish any task you throw at it. 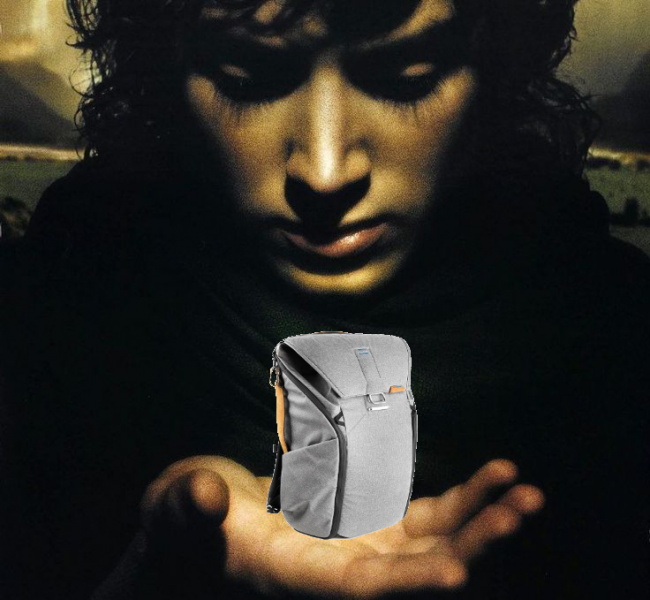 The Peak Design Everyday Backpack is available in 20L for $259.95 or 30L for $289.95. 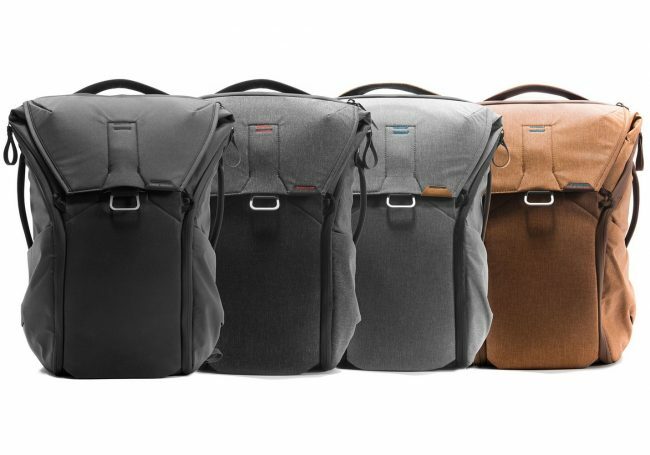 The bags are offered in four colorways: Ash, Charcoal, Tan, Black. You can buy yours directly from Peak Design, starting at $259.95.